Once upon a time, we wrote a parody history of Israel, intended for Setting The World To Rights, in which every sentence contained at least one lie. But the reactions of many of our friends who read it were alarming. Instead of falling about laughing, saying, “Jolly good show! What a super parody!”, most of them read it as fact. These are not opponents of Israel, you understand, but people who are sympathetic to it. We hadn't realised quite how pervasive the prevailing distortions and falsehoods are. When you consider that the parody began: “Judaism is unique among religions in being exclusive to a particular ethnic group (the Jews). It teaches (in its doctrine of ‘the Chosen People’) that all other races are genetically inferior to the Jewish one and that Jews are entitled to rule over them”, you might (we admit we're optimists) understand our unease that our friends took it seriously. We soon realised that we could not put the parody into the public domain. After all, The Protocols of the Elders of Zion is also a crude forgery, but is now part of the standard anti-Semitic repertoire – for instance it is in the Charter of Hamas. We do not want to be responsible for another anti-Semitic canard that might last the next few centuries. However, everyone who read the parody asked us where they could find the true facts. Looking around the internet, we found that there are no satisfactory summaries containing just the facts (though we found many containing falsehoods far worse than our parody!). So we decided that we had to compile a short History of Israel ourselves. In the second century CE the Romans expelled and scattered the Jews from their homeland, which was roughly today's Israel [MAP] [MAP] plus the West Bank, Gaza, and part of Jordan. The Romans then re-named the region Palestine (after the Philistines, ancient enemies of the Jews who had passed into history long before then). As a result of that expulsion and previous expulsions, Jews settled in almost every country of the Old (and later the New) World, forming communities in which they continued to evolve their distinctive culture. The Jews of today are descendants of those Jews and of local people who occasionally adopted the culture through conversion to Judaism (the Jews' traditional religion, which permitted, but seldom sought, converts). conspiracy theories, especially theories that ‘The Jews’ are secretly ‘behind’ the events of history and current affairs. Before the twentieth century, Jews had responded to anti-Semitism in various ways, of which the most important were: endurance, conversion and assimilation. But large-scale conversions occurred only under direct duress, and assimilated Jews were sometimes targeted as much as traditional Jews. During the Enlightenment, Jews were given equal rights in Western countries, though in all but the Anglo-Saxon ones this was little more than a facade. During the nineteenth century, there were sporadic mass murders of Jews in Eastern Europe. In the Arab countries, mass murders and expulsions (albeit on a smaller scale than in Eastern Europe), ubiquitous blood libels and day-to-day persecution, continued much as they always had. In Western Europe, virulently anti-Semitic ideologies arose. This seemed ominous to many assimilated Jews: if anti-Semitism was on the rise even there, at the hub of modernity where assimilation was almost total, then assimilation was not the solution to anti-Semitism and Jews everywhere were in danger. Some of them became socialists, identifying themselves with the struggle for a worldwide workers' paradise in which everyone, even Jews, would be truly emancipated. Some became Zionists. Zionism is the idea that Jews should form a state, where they could live normal lives and defend themselves like the people of other nations, and provide a haven for Jews who might be persecuted elsewhere. Zionism had been proposed by various writers during the nineteenth century. The Zionist movement, as a political organisation, was founded by an Austrian journalist, Theodor Herzl, who in 1894 had decided that his own assimilationist views were untenable. He was in Paris covering the trial of Captain Alfred Dreyfus, a Jewish officer in the French Army who was falsely convicted of espionage in an atmosphere of national anti-Semitic hysteria. Through writing, lecturing and individual persuasion, Herzl rapidly gathered support for his new movement. The First Zionist Congress was held in Basle, Switzerland in 1897. Zionism was opposed by religious Jews because it had a secular objective. Some opposed it because it usurped the role of the Messiah, a mythical person who they believed would one day lead them back to their historical homeland. They considered any Jewish political movement not led by the Messiah futile, even sacrilegious. Initially, Zionism was also opposed, or ignored, by most assimilationists, because it sought separation, which they believed to be the cause of anti-Semitism. As the persecution of Jews continued to increase all over Eastern Europe during the early twentieth century, a significant minority of secular Jews, and a small minority of religious ones, became Zionists. There had been a small Jewish community in Palestine for many centuries, perhaps since Roman times. In 1850, the total Jewish population was about 10,000, most of them in the city of Jerusalem where they had just become the majority (and have remained so ever since). During the second half of the nineteenth century, Jewish philanthropists had been buying land in Palestine for the purpose of resettling Jewish refugees from Eastern Europe. Palestine was very under-populated, in the sense that it could, even with nineteenth century technology, support many times its population at that time, which was less than half a million and declining. It was a run-down backwater of the Ottoman Empire [MAP] where people of many different races and cultures lived, mainly Arabs. There was no administrative region of the Empire called Palestine, and the inhabitants of the region did not think of themselves as a distinct political entity. Western countries introduced immigration controls towards the end of the nineteenth century, and made them ever more stringent as the twentieth century progressed. This was in response to the waves of immigrants, including Jewish refugees, who kept arriving from Russia and Europe. The British offered part of Uganda as a refuge for one million Jews. The Sixth Zionist Congress accepted this as an interim measure in 1903, but the British soon cooled to the idea and took no steps to implement it. Herzl, who had been its most prominent supporter, suddenly died, and the Seventh Zionist Congress finally rejected it in 1905. Also in 1905 there was a vast outbreak of murder of Jews in Russia, resulting in the arrival of thousands of Jewish refugees in Palestine – a total of over 40,000 by 1914. This was incorporated into the terms of the League of Nations Mandate under which, after the war, the British administered a territory that they called Palestine [MAP], consisting of the area that we shall call Palestine (Israel, the West Bank, Gaza, and the Golan Heights), plus today's Jordan. The Mandate required Britain to make arrangements to allow Jews to settle in Palestine and create their National Home. The Jews themselves would finance this, assisted by a charity which was later called the Jewish Agency. They would purchase land for farms and new towns, drain the swamps that spawned endemic malaria, build new infrastructure, and generally develop the country. The British would assist by donating some of the government-owned land which they had ‘inherited’ from the Ottoman Empire, and by maintaining human rights and the rule of law. Between then and the Second World War, about 600,000 Jews came to Palestine. A few of them came because they wanted to be part of the new type of Jewish society that was being created in the Jewish National Home, but most had nowhere else to go and many of them would otherwise have died in the Holocaust or the other mass murders that preceded it. In 1920 there were Arab riots in Jerusalem and elsewhere, in which Jews were murdered. The Jewish community were alarmed that the British authorities seemed reluctant to intervene. After the riots, the British arrested many Arabs and Jews and dealt out harsh prison sentences for illegal possession of weapons. It seemed unfair to Jews that those who had been defending themselves from murder should be treated equally with their would-be murderers. A few months later, the British proclaimed an amnesty and released all those who had been sentenced. One of the Jews imprisoned and then amnestied was Vladimir Jabotinsky, a Zionist leader and former British soldier who had led the defence of Jerusalem in 1920. He became disillusioned both with the British and with the Zionist movement whose policy of peaceful cooperation with the British, he believed, would lead to the destruction of the Jewish National Home. He founded a new movement called ‘Revised Zionism’ or ‘Revisionism’, which aimed for a fully independent Jewish state (not just a ‘National Home’), in the whole of the Palestine Mandate, and also rejected the mainstream Zionist movement's socialistic ideology in favour of a free-market philosophy. In 1921, the Jewish area of Jerusalem was attacked again, Jews all over Palestine were murdered, and many Jewish farms and settlements were destroyed. The British responded by temporarily suspending Jewish immigration. They also removed the Mayor of Jerusalem for inciting anti-Semitic riots, but as a conciliatory gesture replaced him by his nephew Haj Amin al-Husseini, a leader of those riots who had been granted amnesty, and who now did everything in his power to incite anti-Semitic hatred and organise anti-Semitic violence. He added a new libel to the standard repertoire, namely that The Jews were plotting to demolish the Al-Aqsa mosque and replace it by a synagogue. Within a year, he was also appointed Grand Mufti of Jerusalem (i.e. the senior Muslim cleric in Palestine) and became the dominant Arab political figure in the region for the next two decades. In 1923 the British ceded the Golan Heights from Palestine to the neighbouring French Mandate of Syria, and partitioned the Palestine Mandate [MAP] into an Arab autonomous region, which they called Transjordan (today's Jordan), and the western part, which they now called Palestine (today's West Bank, Israel, and Gaza Strip) [MAP]. They barred Jews from settling in Transjordan and announced that the Jewish National Home was to be created only in the western part. In the Arab riots of 1929, the ancient Jewish community living near the holy places in the Arab town of Hebron were massacred and the survivors fled. Jews were also murdered in Safed, Jerusalem and Jaffa. The Jews of Palestine complained that the British authorities had done nothing to prevent these murders. Jewish self-defence militias, which had existed since Ottoman times, grew, and were unified into a single organisation, the Haganah (which means ‘defence’). Arab violence grew worse. The British responded with a combination of force and conciliatory measures – i.e. measures against Jewish immigration and Jewish self-defence. The Jewish population became increasingly fearful for their lives and for those of European Jews, and distrustful and contemptuous of the British. In 1931 some members of the Revisionist Party formed the Irgun (full name: Irgun Tzeva'i Le'umi, meaning National Military Organization, sometimes known by its Hebrew acronym Etzel), which would fight the British for independence, and also retaliate violently for murders of Jews, sometimes by murdering innocent Arabs. Thus it was a terrorist organisation, and great bitterness developed between it and the Haganah, whose constitution required it to act only in self-defence and which followed the mainstream Zionists' doctrine of restraint and cooperation. The Haganah and the Irgun each believed that the other was betraying the Zionist project, undermining its chances of succeeding, and hence endangering all Jews. The rapid development of the country set in motion by the Jewish National Home project dramatically reversed the demographic and economic decline of the previous century. The flow of Arab emigration was replaced by Arab immigration and return of former emigrants. One immigrant was Yasser Arafat, who was born in Cairo in 1929 of an Egyptian father and a mother whose family came from Palestine. When he was four, she died and he was sent to live with relatives in Jerusalem. The Nazis came to power in Germany in 1933. The Grand Mufti (al-Husseini) immediately approached the German Consul General in Jerusalem and offered his services. The Nazis were initially lukewarm to this offer because they still hoped to come to an accommodation (or even an alliance) with the British Empire. In Germany, they immediately embarked on anti-Semitic persecution, which soon included widespread murder. German Jewish refugees began to arrive in Palestine. The Arabs of Palestine demanded a ban on all Jewish land purchases and a complete end to Jewish immigration. In 1936, when the British refused the first demand and responded to the second merely by lowering the Jewish immigration quota, the Arabs responded with riots on an unprecedented scale. In 1937 the Peel Commission proposed that Palestine (i.e. the western part of the original Mandate) would be further partitioned into Jewish and Arab self-governing regions [MAP]. The Zionists accepted partition, though they wanted to renegotiate the proposed borders (mainly because they excluded Jerusalem and several areas that had been developed by the Jewish Agency). But a conference of Arab leaders categorically rejected the idea of partition and declared that the British would now have to choose “between our friendship and the Jews”. Britain chose the former. In the White Paper of 1939 (usually referred to as ‘the White Paper’), it finally abandoned the idea of a Jewish National Home. Jewish immigration to Palestine was to be limited to a further 100,000 in total, spread over five years. Jewish purchases of land were to be forbidden except within existing Jewish areas. After five years (i.e. in May, 1944), majority rule in the form of an all-Palestine legislature was to be introduced. The Arabs made it clear that at that point, they would use their majority in Palestine as a whole to ban all Jewish immigration. All other countries (including Britain itself) had already imposed minuscule immigration quotas, so that in total, the world was prepared to give refuge to only a fraction of the hundreds of thousands of Jews trying to escape from Germany. The rest, and the millions of Jews in Nazi-sympathising countries and in countries that were shortly to be invaded by Germany, were trapped there by that universal consensus, several years before the Germans began the Final Solution. The Nazis, too, sought the friendship of Arab nationalists. They finally accepted the Mufti's offer. The Haganah, in addition to its self-defence activities, organised peaceful demonstrations against the White Paper, and secretly began to support illegal Jewish immigration. The Irgun had been organising such immigration for some time. With its help, and now also that of the Haganah, perhaps 25,000 European Jews succeeded in entering Palestine illegally. The number was so low because there were enormous difficulties: the refugees had to run the gauntlet of both officially- and unofficially-organised violence and expropriation in their home countries; they faced weeks of travel involving extortion, hardship and danger. The authorities in all the countries along their route were trying to stop them (both spontaneously and under pressure from Britain). Then, since they had to come by sea, they had to contend with scarce and unsafe boats (they could not use ordinary shipping lines, of course) and with the Royal Navy. Finally they had to enter and live undetected in Palestine. Meanwhile Arab immigration continued. The number of Arab immigrants to Palestine during the Mandate period is unknown and highly controversial, but the net increase in the Arab Palestinian population was about twice the net increase in the Jewish Palestinian population. When the Second World War began in September 1939, the British outlawed the Haganah. Illegal possession of a weapon was made a capital offence. Heavy diplomatic pressure was placed on all the countries on the main Jewish escape routes to Palestine to close those routes down, and on Mediterranean countries to ensure that no transportation was available. As a Foreign Office minute put it in December 1939 “The only hope is that all the German Jews will be stuck at the mouth of the Danube for lack of ships to take them”. The Royal Navy's patrols to intercept illegal immigrants were increased. Those who were caught were imprisoned on the island of Mauritius in the Indian Ocean, where the regime was designed to be (in the words of a Colonial Office minute of January 1941) “sufficiently punitive to continue to act as a deterrent to other Jews in Eastern Europe”. Internees were also forbidden to join the Allied armed forces. Legal immigration was restricted to levels below even those of the White Paper. For almost a year during 1941, no legal immigration certificates were issued at all. As the war continued, these measures were gradually relaxed. Many Haganah and Irgun members volunteered for the British armed forces: 30,000 of the half-million Jews of Palestine enlisted (as compared with 9,000 of the 1.5 million Arabs). Many volunteered for hazardous operations behind enemy lines. The Irgun promised not to attack British forces for the duration of the war. A small splinter group, Lehi (disparagingly known as the ‘Stern Gang’, after their leader Avraham Stern), refused to cease operations because they deemed that the White Paper had made the British legitimate targets. The British relaxed the immigration restrictions for Palestine in 1943 – Jews fleeing from the Holocaust could now enter Palestine at will if they got as far as Turkey, but by now only a handful were arriving. Conditions at the Mauritius prison were not improved until 1944. When France surrendered in 1940, the Nazis set up an intelligence and propaganda base in Syria (nominally under the control of the puppet Vichy French government), from where, in April 1941, they helped to instigate a pro-Nazi coup in Iraq, headed by Rashid Ali al-Gailani, a former Prime Minister and associate of the Mufti. In support of the coup, the Mufti, who had been deposed by the British for inciting the 1936 riots, declared jihad (holy war) against the British. The coup was soon suppressed by British soldiers (though not before about 150 Iraqi Jews had been murdered). Al-Gailani fled to Germany to join the Mufti who was trying to negotiate a formal Arab-Nazi alliance with Hitler against the Jews and British. They both remained with the Nazis for the rest of the war. The Mufti made Nazi propaganda broadcasts, organised parachute attacks against the British, and helped to recruit an army of over 20,000 Muslim SS volunteers in Yugoslavia, for which purpose he was formally admitted to the SS with the rank of Gruppenführer (Major General). Captured by the French after the war, he escaped (thus avoiding prosecution as a war criminal by the Yugoslav government), and found refuge in Egypt, where he continued to incite violence and demand the total expulsion of Jews from Palestine until his death in 1974. In May 1941, the Haganah began secretly training an elite fighting force (the Palmach). In the late 1930s, some congressmen in the United States argued that Alaska (which was at that time being prepared for Statehood and was in dire need of immigrants) should be exempted from the United States' immigration quotas so that some victims of Nazi persecution could find refuge there. In November 1938, Representative Charles Buckley of New York wrote an open letter to President Roosevelt asking him to support legislation to that effect. Roosevelt refused. The idea also encountered considerable opposition in Alaska itself. It continued to be discussed for several more years but never found enough support. In 1939 the Wagner-Rogers bill, which would have admitted 20,000 refugee children to the United States, failed in the Senate. During the war, most of the Jews of Europe were murdered by the Germans and their allies and collaborators. After the war, the Allies' policy was to force all refugees, including 250,000 Jewish Holocaust survivors, to return to their countries of origin. However, many of the German and Austrian Jewish survivors did not wish to live among the murderers of their families. Many Jews from Eastern Europe found that their properties had been seized and the new occupiers were violently opposed to their return. Many did not want to go and live under Stalinist rule. Over a thousand Polish Jews who did try to return home were massacred in anti-Semitic riots in several Polish cities. At least one, in Kielce, was inspired by a classic anti-Semitic blood-libel (that The Jews were kidnapping Christian children in order to drain their blood). Furthermore, a high proportion of Jewish survivors had become committed Zionists, and wanted to go to Palestine to help build a Jewish state. All Jews who refused to return to their countries of origin were detained by the Allies in camps in Germany and Austria. Those who were caught trying to make their way to Palestine were imprisoned in Cyprus. In 1945 the League of Arab States (or Arab League) was formed, and as one of its first acts, declared a boycott of all Jewish businesses in Palestine. When it became clear that Britain was not going to reverse its White Paper policy, the Haganah became a Jewish independence movement. They ceased their former close cooperation with the British authorities in capturing Irgun and Lehi members, and instead formed an alliance with those organisations on condition that they follow the orders of a joint United Resistance Movement. They continued collecting, and began manufacturing, weapons. They continued clandestine military training, even inside the detention camps in Europe. They attacked immigration offices and other property – on one occasion destroying ten of the eleven bridges over the river Jordan – and sought out and killed individual Arabs who had murdered Jews. The United States put pressure on Britain to allow 100,000 Jews to leave the camps and enter Palestine for humanitarian reasons. Britain refused. But it announced that it would withdraw from its Mandate (now a United Nations Mandate) in 1948. The United Nations proposed a partition plan for the aftermath [MAP]. It allocated the Jews more territory than the Peel Commission had, mainly by including most of the virtually empty (and, at that time, virtually uninhabitable) Negev desert. However, this territory did not include most of the Jewish historic or holy sites, nor many Jewish settlements, nor Jerusalem; moreover it was not defensible militarily. This plan was a bitter prospect for the Zionists, but they accepted it. The Arabs refused. When the British left, the Jews of Palestine declared their new State of Israel in the territory allotted to them by the United Nations. The Chairman of the Jewish Agency and the Zionist movement, David Ben-Gurion, was named Prime Minister of the Provisional Government of Israel. The Haganah was renamed the Israel Defence Forces (IDF). The first two countries to recognise Israel were the United States and the Soviet Union. Most other countries, but no Arab ones, followed suit. The first act of the provisional government was to abolish all restrictions on Jewish immigration. Jewish refugees began pouring into Israel. Despite the fact that a new state in the Arab portion of Palestine would likewise have been immediately recognised by the nations of the world, including Israel, the Arabs of Palestine did not declare a new state in their portion. Instead, Palestine was invaded by the armies of Egypt, Jordan, Syria, Lebanon and Iraq, plus a token contingent from Saudi Arabia. The PLO was not founded until seventeen years later, but large numbers of Arab irregulars from Palestine and abroad had already been staging murderous attacks on a scale that dwarfed anything the country had yet seen: 1,200 Jews, and even larger numbers of Arabs, were killed in those attacks and in the open fighting that broke out as a result, during the few months before the Declaration of Independence. The departing British had made only sporadic attempts to halt this violence or to defend the borders and Jewish population of Palestine from incursions by the Jordanian army and by irregulars. The Arab armies had initial success: the IDF was outnumbered and greatly outgunned – having at the outset no heavy artillery, few armoured vehicles, no military aircraft, and no navy (all of which the Arab armies had) – and was defending impossibly vulnerable territory. Though the IDF was better trained, and many of its members were veterans of the British army in the Second World War, the Jordanian Army in particular had been well trained and armed by Britain and had many British officers including its commander, Colonel John Glubb. The local Arabs also inherited most of the fortifications (except in Jerusalem, where the Jews seized them) and weapons left behind by the British. The fighting was intense and bitter. Some Jewish villages put up astonishing resistance with grossly inferior and makeshift weapons. Some managed to hold out for weeks in epic sieges, but many were overrun by Arab armoured columns. In some of those, the inhabitants were massacred; from some, they were taken into captivity; from most, they were merely expelled, or fled. In no location that had been captured by Arabs were any Jewish inhabitants allowed to continue living in their homes. Jerusalem was cut off and besieged. Its Jewish inhabitants began to go hungry and were bombarded continuously by artillery. The Arab armies advanced towards the Israeli population centres on the coast from the east, south and north. The Egyptian Air force bombed Tel Aviv and the Egyptian Navy began a blockade of Israel's ports and landed troops from the sea. The IDF managed to halt all the Arab advances before they reached the main Israeli population centres, except the Old City of Jerusalem with its ancient Jewish Quarter, where the Jews surrendered and were expelled. The United States had imposed an arms embargo on both sides, and kept it in place after the Arab armies attacked. Britain continued to supply the Arab armies. Because of a fortuitous quirk of Cold War politics, Israel was briefly able to buy weapons from communist Czechoslovakia. When these began to arrive, the IDF began to take the initiative. They captured several key towns, and territory to connect their populated areas. They broke through to Jerusalem, relieved the siege but failed to recapture the Old City, which was then annexed by Jordan; Israel held the newer, western part of Jerusalem, and the city remained partitioned from then until 1967. Jordan also annexed the other Palestinian territory it had captured, called it ‘the West Bank’ – forbidding the use of the term ‘Palestine’ on official documents referring to that territory – and expelled all its Jews. Egypt expelled all the Jews from the Palestinian territory it had captured (the Gaza Strip), and remained in occupation there until 1967. During the following few years, about 800,000 Jews remaining in Arab countries were either forced or ‘allowed’ to leave on condition that they leave their property behind, and nearly all of them came to Israel. During the war, about 725,000 Arabs living in the territories allocated to or captured by Israel moved to the Arab-controlled area of Palestine or to neighbouring countries, and about 30,000 to locations within Israel. There were diverse reasons for this: some were fleeing the fighting; some were combatants; some heeded local leaders who urged or ordered them to get out of the way of the invading armies and of imminent bombing by Arab air forces; some, such as the inhabitants of villages overlooking the Tel-Aviv-Jerusalem road, were expelled by the IDF for military reasons. Some were expelled in acts of spite, revenge or callousness. There was one massacre of Arabs by Jews: During the campaign to relieve the siege of Jerusalem, the Irgun offered, and was authorized, to help the IDF by capturing an Arab village, Deir Yassin. At the end of the battle, they murdered some of the villagers. The circumstances of the deaths, and the number killed, remain bitterly disputed to this day. In 1987 a study by Bir Zeit University (a Palestinian Arab university on the West Bank) concluded that the number murdered was between 107 and 120. The worst example of expulsion occurred at the Arab towns of Lydda and Ramla. These were astride the country's main north-south and east-west roads and railway, and the IDF needed to capture them during a desperate battle to defend Tel Aviv from the main strength of the approaching Jordanian army, while also holding off the Syrian army which had crossed the river Jordan in the north and was using its superior artillery and air superiority to advance from its bridgehead. Ben-Gurion took the decision to force all 45,000 inhabitants of the two towns to leave, partly to allow the IDF to fight there (about 250 civilians had already been killed in Lydda in the crossfire of the previous day's battle with the Jordanians), but partly to impede the Jordanians' advance and increase the logistical burden on them. Some of the refugees were carried to the edge of Jordanian-held territory in buses driven by the Palmach, but most had to walk, and in the end some 335 of them died of dehydration and exhaustion on the way. The tactic worked – the Jordanians were delayed for long enough – but it caused moral revulsion and a fierce debate among the Israeli leadership, and was not used again. Probably the most common single reason why Arabs left was that they feared that they would be harmed if the Jews won the war. In the event, the 160,000 who remained in Israel fared incomparably better than those who left. The latter were not permitted by any of the Arab governments into whose jurisdiction they came (including their ‘own’ Jordanian government on the West Bank) to lead normal lives. On the contrary, they were herded into refugee camps where they were systematically prevented from rehabilitating themselves or integrating into the local populations or (except in Jordan) acquiring citizenship of the host country. Today, over half a century later, although a proportion of refugees have been integrated, the basic policy of intentional misery remains in effect: the camps, including those in the areas now administered by the Palestinian Authority, are still occupied. In contrast, the Arabs who remained in Israel became full citizens of the new state, and those who were internally displaced were resettled and integrated. They became, and they and their descendants remain to this day1, the only Arabs in the Middle East who elect representatives to a democratic parliament, or live under the rule of law, or enjoy full human rights in the Western sense of the term. The only exception to their legal equality was that they were not allowed to join the IDF and were exempted from conscription. However, two small ethnic groups, the Druse and the Circassians, later asked for, and were granted, exemption from this exemption. In addition, Bedouins were granted the right to join the IDF voluntarily, and traditionally do so, and so were Christian Arabs2. When the United Nations envoy Count Folke Bernadotte proposed a new partition plan which, among other things, again did not assign Jerusalem to Israel, he was assassinated by Lehi. Ben-Gurion ordered: “Arrest all Stern Gang [Lehi] leaders. Surround all Stern bases. Confiscate all arms. Kill any who resist.” Virtually all Lehi members were indeed arrested and Lehi ceased to exist. Ben-Gurion then demanded that the Irgun be dissolved. Any members of the Irgun who unconditionally handed over their weapons and joined the IDF, would receive amnesty for their previous crimes. Otherwise they would be treated as criminals. The Irgun, in a bitter statement in which they said that they evidently valued the lives of IDF soldiers more than the Israeli government did, complied, and its members joined the IDF. On October 1, 1948, four and a half months after the termination of the Mandate and Israel's simultaneous Declaration of Independence, a council of prominent Palestinian Arabs met in Gaza and declared themselves to be the ‘Provisional Government of All Palestine’, electing the former Grand Mufti (al-Husseini) as its President. This claim was briefly recognised by most Arab states but by no other state, but was angrily rejected by King Abdullah of Jordan. A rival group of dignitaries in Jericho voted for union with Jordan and declared Abdullah King of all Palestine. Both claims were soon forgotten: Egypt did not permit the ‘Provisional Government’ to meet again, and Jordan reluctantly gave up its territorial claims beyond the West Bank when Britain threatened to cut off arms supplies. But the Arab nations and people still insisted on the principle of Arab rule over the whole of Palestine, and would continue to fight and kill for this principle for decades to come. 1. Note added 2005-02-03: This was written before the Iraqi election on 2005-01-30. 2. Note added 2005-01-21: Since the 1990s, Muslim Arab Israelis not from those groups have also been allowed to join the IDF, and a few do so each year. After many months of fighting, Israel had succeeded in surviving, defeating the Arab armies and consolidating its now larger territory. But over 6,000 Jews – about one percent of the Jewish population of Palestine – had been killed. Many more were wounded or made homeless. The survivors had been traumatised, and their economy and agriculture were devastated. Jewish immigration was prodigious, especially from the refugee camps of Europe and from Arab countries where the Jews were being forced out. Within about four years the immigrants who had arrived after independence already outnumbered the ‘pioneers’, but their successful absorption was only one of the achievements of which the builders of the new state became proud. Israelis soon began to make world class contributions to science, technology, the arts and agriculture. Israel is a free and prosperous nation with a distinctive, diverse and tolerant culture, exceeding many of the most optimistic expectations of its founders. Of the approximately 100 new independent states that have been created since 1945, Israel is the only one of which that is true. And it has remained a haven for Jews fleeing persecution, or simply seeking a better life, from anywhere else. Theodor Herzl had said of the First Zionist Congress in 1897: “In Basle I founded the Jewish state. Maybe in five years, certainly in fifty, everyone will realise it.” He was proved right, almost to the year. Had he lived, he would have been 88 years old at the time of Israel's Declaration of Independence. The Israeli War of Independence formally ended in 1949 with armistice treaties between Israel and its four neighbours: Lebanon, Syria, Jordan and Egypt. (Iraq assigned the territory it had captured to Jordan and withdrew without signing an agreement.) Under the treaties, Israel agreed to withdraw from all Egyptian and Lebanese territory it had captured, and the Arab countries agreed to withdraw from all territory they had captured inside Palestine, other than Gaza, the West Bank, and East Jerusalem. The treaties also required the parties to resolve their differences peacefully in future. This was not to be. 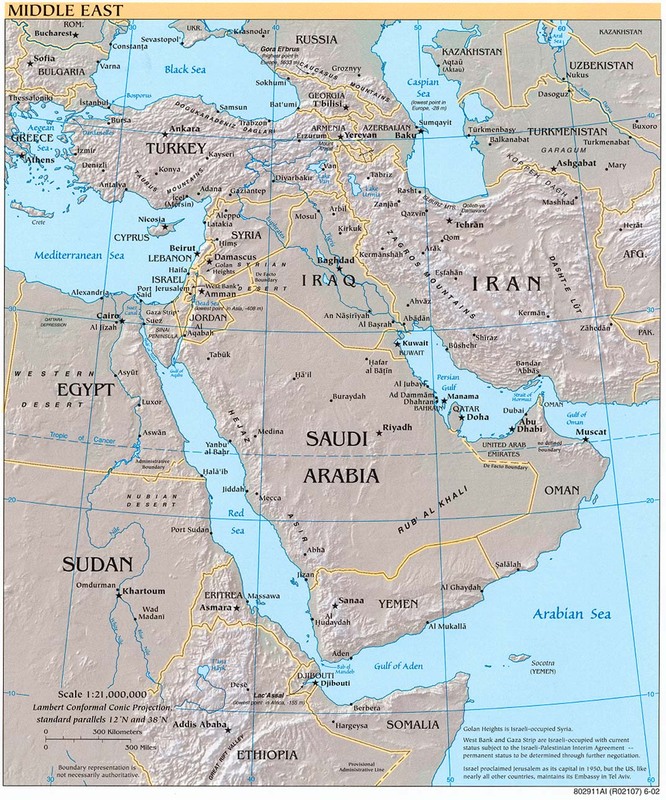 The Arab countries stressed that they remained at war with Israel. So as Israel struggled to rebuild its economy, absorb vast numbers of destitute immigrants and build the institutions of a modern society, its people were under constant attack. Arab soldiers and civilians frequently murdered Israelis venturing within rifle range of the border. Arab artillery would shell Israeli towns. Every few days, Arab terrorists (known at that time as ‘fedayeen’) would cross the border and murder Jews. Israeli farmers would plough their fields in armoured tractors to protect themselves from snipers. In border towns, people slept routinely in underground shelters. Israel annexed all the territory that it had captured in Palestine. Most Israelis considered this to be the legal and justified action of a victim of an aggressive war. Having just sustained heavy casualties in defending indefensible borders in such a war, they felt morally obliged not to return to them, especially as their enemies were still committed to Israel's complete destruction regardless of borders. Israel refused to allow back or compensate the Arabs who had fled during the war. The Israeli government believed that a settlement of Arab refugees' claims should form part of a peace treaty, along with the claims of Jewish refugees who had been expelled from Arab-held parts of Palestine, and other grievances arising out of the same war. Israeli attitudes on this issue hardened further during the following few years, when hundreds of thousands of Jewish refugees arrived from Arab countries, most of them having been dispossessed. The successors of the mainstream Zionist movement. This group, whose largest member today is the Labour Party, was dominant in every ruling coalition in the Knesset until 1977. The successors of the Revised Zionist movement. The largest member of this group today is the Likud party, which has since 1977 alternated with the Labour Party in being the main party in government. The religious parties. The largest, the National Religious Party, was the main party representing religious Jews who supported Zionism. Other religious Jews were still suspicious of Zionism. A small proportion still considered the State of Israel sacrilegious and actively opposed it. Because of the proportional-representation system, religious parties have frequently held the balance of power in shaky coalition governments, and have often won concessions in return for their support even though all of them combined have never gained enough votes to lead the opposition, let alone the government. The religious parties (of all kinds) had three main items on their political agenda. First, they wanted state funding for their own activities, especially religious schools; second, they wanted special privileges for orthodox Jews, such as exemption from military service; and third, they wanted certain restrictions on the lives of all Israelis, such as a prohibition on shops opening on the Sabbath. Many secular Jews (who have always been the overwhelming majority in Israel) felt anger and contempt for the non-Zionist religious factions because, during the 1930s, many European rabbis had discouraged their parishioners from fleeing while it would still have been possible. At the time of the UN partition plan in 1947, ultra-orthodox groups within Palestine had petitioned the UN not to allow secular Jews to rule over them. The first act of the Provisional Government of Israel in 1948 had been to abolish all restrictions on the immigration of Jews. In 1950 this was formalised in the Law of Return, which stated that on reaching Israel any Jew (with certain exceptions such as criminals fleeing justice) must be allowed entry. A companion law granted such immigrants immediate citizenship. The exact definition of ‘Jew’ did not matter much at first, but within a few years a struggle developed between the Zionistic interpretation laid down by Ben-Gurion (which defined a Jew for the purposes of the Law of Return as “anyone who declares in good faith that he is a Jew”) and religious definitions. The present definition is a compromise: Law-of-Return privileges are granted to Jews according to the religious definition (including converts to, but not from, Judaism), and to their spouses, children and grandchildren, and also to Righteous Gentiles (non-Jews who have risked their lives to save Jews from persecution) and their spouses, children and grandchildren. In parallel with the Law of Return, Israel has a normal immigration policy resembling that of other Western countries: over the years it has accepted many non-Jewish immigrants and asylum-seekers, from Vietnamese boat people to Muslim refugees from Bosnia and Kosovo, as well as people whom the secular authorities deem to be Jews but who are not in any of the above categories. The combination of all these arrangements has ensured that very few, if any, people satisfying Ben-Gurion's definition have ever been denied entry to Israel (or citizenship, eventually) and large numbers of people not satisfying it have also been welcomed and have become citizens. Jordan failed to comply with the Armistice Treaty provision for free access to holy places for worshippers. In 1951, King Abdullah of Jordan was assassinated at the al-Aqsa Mosque in Jerusalem, for allegedly wanting to make peace with Israel. He was succeeded by his grandson, King Hussein. The few Jews remaining in Arab countries continued to be persecuted in the traditional ways, but now in addition they were often charged, individually or collectively, with spying for Israel, and punished accordingly. Blood libels and other incitements to anti-Semitic hatred were encouraged by Arab governments, becoming part of the curriculum of schools and the vernacular of academics, politicians, writers, journalists and diplomats. By the time of the Suez war in 1956 (see below), the standard-issue equipment of all Egyptian officers included a copy of Adolf Hitler's Mein Kampf, translated into Arabic. The Soviet dictator Josef Stalin's general paranoia focused particularly on Jews, and now on Israel. While the 1948 war was still in progress, he ordered Czechoslovakia to cease supplying arms to Israel. In 1949 the Soviet press began an ‘anti-cosmopolitan’ campaign – ‘cosmopolitans’ being a code word for Jews. Many Jews were arrested on trumped-up charges, tortured, and executed or sentenced to long terms in labour camps. In 1953 Stalin ‘discovered’ a fictitious plot by a group of doctors, most of them Jewish, to overthrow the Soviet regime. Mass murder of Jews was probably averted only by Stalin's own death a few weeks later, after which the new Soviet leadership disavowed the ‘Doctor's Plot’ and posthumously annulled the fifteen death sentences already carried out on account of it. However, the Soviet Union continued to persecute Jews, and its foreign policy stance became violently anti-Israeli. In 1955 it began supplying large quantities of arms to Egypt and Syria. Egypt signed a treaty with Syria and Jordan placing the Egyptian dictator Gamal Abdul Nasser in command of all three armies. This was one of the high points of the pan-Arab nationalist movement, led by Nasser, which wanted to unite all Arabs into a single nation. In July, 1956, Egypt nationalised the Suez Canal, an international waterway owned by the British and French governments. Israeli ships, and ships travelling to or from Israeli ports, were banned from using the Canal. Nasser ignored the UN's perfunctory protest. He had already imposed a similar ban on another international waterway, the Straits of Tiran, thus blockading Eilat, the port that Israel was trying to develop at its southern tip. Violent incidents on Israel's borders increased. Jordanian and Egyptian soldiers and fedayeen crossed the border and attacked both military and civilian targets. The shelling of Israeli towns and villages within range of Egyptian artillery became almost continuous. Israel prepared for war against Egypt. It planned to lift the blockade of Eilat by seizing and holding Sharm-el-Sheikh, a town where a large military base had been built, dominating the Straits of Tiran. It also planned to retaliate for Egypt's attacks, and impair Egypt's ability to threaten invasion, by striking at its army, now deployed on the Sinai peninsula and in the Gaza Strip. To do all this, the IDF needed modern weapons. The United States would not supply any. Nor would any Soviet-bloc country including Czechoslovakia (which was now supplying Egypt). Nor would Britain, which still considered itself an ally of the Arab countries – now excluding Egypt. But Israel had been cultivating a relationship with France, which prided itself on its independent foreign policy and agreed to sell weapons to Israel. Britain and France had been secretly planning to recapture the Suez Canal, despite pressure from the United States to acquiesce in the nationalisation. Now the French informed the Israelis of this plan and invited them to coordinate their own attack with it. In negotiations which, for many years afterwards, all three countries would deny ever took place, they agreed that Israel would capture the Canal, then the British and French would call for both sides to withdraw, and when Nasser refused, British and French forces would be sent in to ‘protect’ the Canal zone. Israeli paratroopers landed in the west of Sinai. Israeli forces captured Gaza, and Israeli armoured columns drove westwards into Sinai and southwards towards Israel's main objective, Sharm-el-Sheikh. The following day, Britain issued an ultimatum to Israel and Egypt, saying that unless both sides withdrew to a distance of ten miles from the Canal, force would be used against them. During the next six days, the IDF defeated the Egyptian army in Sinai in fierce fighting, capturing Sharm-el-Sheikh and most of Sinai. Complying with the British ultimatum, it halted ten miles from the Suez Canal. The Egyptians did not withdraw from the Canal, and British and French forces invaded, landing at Port Said and pushing southwards through the Canal zone. There was an enormous international outcry, led by the United States. President Eisenhower put intense pressure on Britain and France to withdraw. They complied: their forces halted, and soon afterwards returned home in humiliation. The British Prime Minister, Anthony Eden, resigned, a broken man. Eisenhower threatened Israel with UN economic sanctions and expulsion from the UN if it did not withdraw too. The Soviet Prime Minister sent a private letter to Ben-Gurion reminding him that the Soviet Union possessed missiles that could reach Israel. Israel sent a delegation to Washington, arguing that to withdraw without receiving any concessions from Egypt about future violence or blockading of international waterways would be to invite a repetition of the situation. Eisenhower was adamant about unconditional withdrawal, but he himself did make some concessions: he assured Israel that the United States would from now on keep the Straits of Tiran open, and that the international community would act ‘firmly’ if Egypt did not allow Israeli shipping through the Suez Canal. He also arranged for a UN Emergency Force to be deployed in Sinai and Gaza, whose job would be ‘to assure the scrupulous maintenance of the armistice agreement’ – in particular, to ensure that those territories were not again used to launch fedayeen raids, artillery barrages or armed threats against Israel. Israel withdrew. The UN Emergency Force was deployed. The fedayeen raids and other attacks from Egypt ceased. The Straits of Tiran and the Suez Canal were opened to Israeli shipping. The Suez war became a widely-cited symbol of the last gasp of Imperialism and of the futility of Western intervention in the affairs of other countries. Israel had lost 172 dead and 817 wounded. The Egyptian authorities soon began to harass ships heading to or from Israel through the Suez Canal – delaying them and sometimes confiscating cargoes. The UN brokered a compromise under which cargoes would always be owned by the non-Israeli party to the trade, during their time of passage through the Canal. Israel agreed, under protest, to this cumbersome and illegal requirement, but the first ship to try it (the Greek ship Astypalea) was arrested anyway, and its cargo of 500 tons of Israeli cement was confiscated. For all practical purposes the Canal was again closed to Israel-related shipping. The ‘firm action’ promised by Eisenhower never materialised. When Israel declared independence, the Arab League's boycott of Jews in Palestine became the anti-Israel boycott, enforced by law in every Arab country, and was then broadened in scope and institutionalised: individuals or companies anywhere in the world that had any dealings with Israel were not permitted to do business anywhere in the Arab world; companies that did business with those companies were also boycotted. Travellers with an Israeli stamp in their passports were not permitted to enter any Arab country. Many multinational companies complied with the boycott. Many did not, but in 1993 a study by the Israeli Chambers of Commerce estimated that the total loss to the Israeli economy caused by the boycott had been some $45 billion. Arab governments also used boycotts and other pressures to have Israel excluded from international organisations. As a result, for instance, Israel is to this day the only country in the world not permitted to join the International Red Cross. It is the only member of the United Nations not permitted to sit on the Security Council. It is also not permitted to participate in the World Court, and is excluded from most United Nations organisations such as UNICEF. Syria built a military base on the Golan Heights, with gun emplacements cut out of the rock and invisible from the air, and a complex system of fortifications linked by underground tunnels. From there, long-range artillery dominated a region of northern Israel and caused a steady stream of deaths, injury and destruction. France continued to sell weapons to Israel. In 1957, Israel began building a nuclear reactor and research facility at Dimona in the Negev, purchasing French technology to do so, and used this to manufacture its own nuclear weapons. In 1959, the Egyptian Army suddenly crossed the Sinai peninsula. Israel's intelligence and early warning systems failed to detect the threat until hundreds of Egyptian tanks were at the border, where they faced no more than thirty tanks on the Israeli side. Israel was unprepared and took a further 24 hours to mobilise an army and rush it southwards to face the invasion. But the Egyptians did not invade. Instead they gradually withdrew. One of the perennial strategic facts of the Arab-Israeli conflict has been that because of Israel's small population, the only way it can raise an army large enough to repel a full-scale invasion is by mobilising more or less every eligible citizen. Such a mobilisation can be achieved in the remarkably short time of 48 hours; however, this is at the cost of shutting down most of Israel's civilian economy, so each such mobilisation is in itself a major economic disaster, and to remain mobilised for very long would bankrupt the country. Israel's options for defending itself against attacks other than invasion were similarly limited. It adopted a policy of retaliation. When Arab soldiers had killed Israelis or collaborated with terrorists, the IDF might retaliate by shelling or bombing military installations or other valued property of the country in question. When terrorists could be identified as coming from a particular village, the IDF might raid that village, order the inhabitants out, and blow up houses. The IDF also became skilled at guarding the border, so that infiltrators were often killed there before they could do any further harm. And Israel developed a formidable intelligence service, the Mossad. In 1962, President Kennedy initiated a historic change in the United States' attitude towards the Middle East (against the State Department's fervent opposition) by authorising the first ever sale of American weapons – Hawk anti-aircraft missiles – to Israel. The British government, too, was willing to overrule the opposition of the Foreign Office and authorise arms sales to Israel. In 1964, Syria proposed to the Arab League that the Palestinian Arab refugees, who were still being kept in camps in various Arab countries, could be used to destabilise Israel. The proposal was accepted, and the Arab League set up the Palestine Liberation Organisation (PLO) with the purpose, according to its founding manifesto, of ‘liquidating Israel’. Despite its name, the PLO did not campaign for self-government for Palestinian Arabs, nor was any attempt made to install the PLO, or any Palestinian Arabs, as the government of those parts of Palestine that had already been ‘liberated’ in 1948 (namely Gaza, the West Bank and East Jerusalem). The PLO soon fragmented into factions with widely differing ideologies and allegiances, but all agreeing on the basic purpose (Arab government over the whole of Palestine, and the destruction of Israel), and using the same basic means: murder of Jews. Arafat's Fatah movement, which had been in the process of formation at around the same time, became the largest single faction. The Soviet Union, as part of its massive, mainly secret campaign to destabilise the West by supporting terrorist organisations, provided extensive training and other services for the PLO. The PLO was far better armed and funded than any other terrorist organisation before or since – and it gradually made its presence felt in an increasingly ferocious and spectacular campaign of murder. In 1967, Syria stepped up its artillery attacks from the Golan Heights. Cross-border artillery duels followed. Several Syrian fighter aircraft were shot down in dogfights over the Heights. The Soviet Union gave Syria fabricated evidence that Israeli armour was massing in northern Israel preparing to invade. Syria massed its forces on the border and invoked its defence treaty with Egypt. Jordan then signed the treaty too. The Soviet Union sent seventy warships to the Eastern Mediterranean and again made ominous hints about protecting its allies, especially Syria. The IDF, on high alert since the Egyptian deployment in Sinai, was now fully mobilised. Even so, it was nominally the weaker force. Its total strength was 264,000 soldiers, 80% of whom were reservists, with 800 tanks and 300 combat aircraft. It was facing three armies, totalling 347,000 soldiers, most of whom had been training for this moment for years, with 1,900 tanks and 700 combat aircraft – and few Iraqis had yet arrived. Israel struck first. Its air force attacked the Egyptian air force. Many Egyptian aircraft were destroyed on the ground, and others in combat. At Nasser's behest, the Syrian and Jordanian air forces attacked Israel. They were effectively destroyed. Britain, France and the United States imposed an immediate arms embargo on both sides. The Soviet Union continued to supply weapons to the Arabs. The IDF, now with air supremacy, attacked on the ground in Sinai and defeated the Egyptian army. Soon they had captured the whole peninsula, opened the Straits of Tiran, and halted at the Suez Canal. Then, despite their fear of direct Soviet intervention, they attacked and captured the Golan Heights. On the first day of the war, the Israeli Prime Minister Levi Eshkol had sent a secret message to King Hussein of Jordan via the UN: “We are engaged in defensive fighting on the Egyptian sector, and we shall not engage ourselves in any action against Jordan, unless Jordan attacks us. Should Jordan attack Israel, we shall go against her with all our might.” But thanks to the fog of war and erroneous reports from Nasser of Egyptian victories, King Hussein believed that Israel was about to be defeated. Even when Jordanian forces began shelling West Jerusalem, the IDF still held off for several hours. The Knesset building was among those hit, and members adjourned to the cellar. Finally the IDF attacked, captured East Jerusalem in fierce street-to-street fighting, defeated the Jordanian Army and captured the West Bank. Lebanon, which had not participated in the threats against Israel, was not attacked. All these engagements were decisive victories and took only six days (hence this war is known as the Six Day War) but they were not easy victories. All three Arab armies fought competently and bravely in many engagements. Their effectiveness and morale were impaired mainly by the elimination of their air power during the first hours of the war, an action which cost Israel itself nearly a quarter of its fighter aircraft. In all, Israel lost 777 dead and 2,586 wounded during the six days – proportionately more than the United States lost during the Vietnam war. Nevertheless, among Israelis, grief was now combined with an overwhelming sense of relief that they had survived. The UN Security Council then issued its deliberately ambiguous Resolution 242 which Israel interpreted as being similar to its own land-for-peace proposal and the Arab countries interpreted as endorsing their demand for unconditional withdrawal. Given that there was to be no land-for-peace deal in the immediate future, Israel faced the problem of what to do with that land, which had 1.2 million Arab inhabitants. A small minority of Jewish Israelis favoured returning it unconditionally to Jordan and Egypt, mainly on the grounds that anything less would cast Israel in the role of occupier and create increasing resentment among the population. Another small minority wanted Israel to annexe the captured territory. The great majority opposed both these ideas, because both of them would destroy the possibility of any future land-for-peace deal. Also, returning unconditionally to the situation that had just ended in a war seemed perverse and irresponsible, and in the meantime the territories constituted a much-needed buffer against attack. The closest Jordanian soldier or artillery piece was now separated from Tel Aviv by 40 miles, plus the River Jordan, as opposed to 12 before. The Egyptian army, which had been an hour's drive from Tel Aviv and within artillery range of Ashdod and Ashkelon, was now 200 miles away and across the Suez Canal. With the Syrian guns silenced, children and teenagers in Northern Israel who had seldom in their lives slept above ground, could now do so safely. This normalisation highlighted the blighted lifestyles that Israelis within range of those guns had been leading, and made returning the Golan Heights to the Syrian army unthinkable to many. And with Sharm-el-Sheikh in Israeli hands, the blockade of Eilat was lifted, and Israelis were in no mood to trust international promises on that issue again – indeed, none were offered this time. The Jerusalem issue was especially uncontroversial among Jewish Israelis. Israel annexed East Jerusalem, reuniting the city. Arabs living there were given the option of becoming Israeli citizens or retaining their Jordanian nationality with a right of residence in Israel. Jewish sightseers and worshippers were able to visit the Old City for the first time in 19 years. The Jewish holy places had been desecrated and allowed to fall into disrepair. Work began on restoring them and the Jewish Quarter. A military government was instituted in the West Bank and Gaza, with orders to prevent violence but otherwise to interfere as little as possible in the lives of the residents. Residents were allowed to trade freely with Arab countries, and to visit them. They were also allowed to trade with, and seek jobs in, Israel, and many did so. Tens of thousands of Palestinian Arabs were allowed to return from Jordan to the West Bank, where businesses flourished under the influx of Israeli and foreign tourists. Arabs from the West Bank and Gaza became a common sight relaxing on Israeli beaches. The Palestinian Arab press became the freest in the Arab world, and institutions such as human-rights organisations and a competent civil service gradually developed. One of the most controversial and complex issues raised by Israel's capture of the West Bank and Gaza was whether Jews should be allowed to live there, and if so, under what conditions. The Israeli government's initial attitude was to ban Jews altogether, except for day visits. However, within months, public opinion had forced them to make some exceptions. To the Jews of Hebron, for instance, the period between 1936 (when the last Jews had been forced to leave the city) and 1967 was no more than a brief interlude, of a familiar type, in their long history. Jews had lived near the holy sites in Hebron, and been expelled, and had returned, many times over the millennia. That some religious Jews wanted to live there again had nothing to do with Israel or Zionism. Indeed, the community massacred in 1929 had been largely anti-Zionist. But the prospect of the Israeli government joining the long list of rulers of Hebron who had attempted to keep the city forcibly Jew-free, was too much for the Israeli public to bear. So when a group of religious Jews, including some children of those who had been murdered in 1929, pretended to be Swedish tourists and checked in to a hotel in the centre of Hebron, and then refused to return to Israel, the Israeli government eventually relented and let them stay, on condition that they not live within the city, but build new houses on the outskirts, a short distance from the main Jewish holy site. These became Kiryat Arba, the first of what have come to be known as ‘Jewish settlements’. In the great majority of the settlements, the inhabitants have always gone to some lengths to be good neighbours to the local Arab communities, trading with them, employing them, providing services such as health care, and trying to maintain good relations even when this is not reciprocated and even when terrorist murders occur. But the Jews of Hebron have a programme of gradually re-taking possession of the ancient Jewish Quarter (most of which was razed and desecrated under the Jordanian occupation) from the existing occupants whom they regard as squatters. They have sometimes used intimidation and assault – not only against Arabs but also against Israeli police – to achieve this. Today, tension between the 6,000 Jews and the 150,000 Arabs of Hebron runs very high. There are frequent murders, mostly in the form of terrorist attacks on Jews, but in 1994 a Kiryat Arba doctor opened fire in a mosque in Hebron, murdering 29 Arabs before being killed himself. An example of a very different type of settlement is Gush Etzion. Established in 1970, it is built on land at the southern approaches to Jerusalem, which had been purchased by the Jewish Agency in the early days of the Mandate. It had first been a collective farm, which was abandoned during the riots of 1929. An attempt to re-settle it was cut short by the riots of 1936. In 1943, four villages were built there. Orchards were planted and the villages prospered. Five years later, just before the declaration of the State of Israel, Gush Etzion was attacked by the Jordanian Army and Arab irregulars, heading for Jerusalem. It was besieged, and the defenders radioed for reinforcements. The Haganah could spare only 35 men, but they were ambushed on the way there and all were killed. Further attempts to lift the siege failed too. This became one of the epic sieges of the War of Independence, with the defenders isolated for many months, beating off attack after attack but suffering terrible casualties. Finally, with Jordanian armoured vehicles inside the defences, the surviving defenders surrendered. At one of the villages, Kfar Etzion, there were only fifteen of them left. They were asked to stand in a row for a photograph and were murdered by machine gun fire. Some of the surviving civilians, including an Arab family who were friends of the Kfar Etzion people and had taken shelter there, were then murdered too, and the remainder were taken to captivity in Jordan together with the other Gush Etzion survivors. Despite its outcome, the battle is considered by Zionists to be a key event in their history, epitomising the permanent commitment of Jews to their land. Ben Gurion said: “I can think of no battle in the annals of the Israel Defense Forces which was more magnificent, more tragic or more heroic than the struggle for Gush Etzion ... If there exists a Jewish Jerusalem, our foremost thanks go to the defenders of Gush Etzion”. Then I toured the Gaza Strip, from which the fedayeen had gone out on their murderous assignments for so many months and in which the Egyptians had kept a quarter of a million men, women and children (of whom nearly 60 percent were Arab refugees) in the most shameful poverty and destitution. I couldn't help comparing what I saw in the Gaza Strip to what we had done – even with all the mistakes we had made – for the Jews who had come to Israel in those same eight years. When the survivors of Gush Etzion were released in 1950 and arrived in Israel, they were not confined to camps. After the Six Day War, a group including some of the children of the original inhabitants of Kfar Etzion petitioned the Israeli government to be allowed to return to the village and rebuild it. The petition was granted. So long as a negotiated peace was not on offer, Labour Party supporters and their allies wanted to impose viable and defensible borders unilaterally, as far as this was possible. To this end, they supported the building of new settlements close to the 1948 cease-fire line, in areas that they expected to be recognised as part of Israel in a future peace treaty. They also supported the establishment of settlements that could serve as military outposts in the Jordan valley, and some settlements in Sinai. They also sought to demonstrate, in this way, that the Arab governments' policy of relentless war would have long-term costs in addition to the short-term ones that the IDF was inflicting. Likud supporters were not expecting the Arab countries' implacable stance to change in the foreseeable future, regardless of what Israel did. They reasserted the Revised Zionist position that the whole of Palestine should become Israel, and that Jews should be free to purchase land anywhere. In addition, when in power, they favoured financial support for settlements. Few, however, advocated annexation of the West Bank and Gaza for the foreseeable future. Religious Jews underwent a fundamental reversal of attitude. They increasingly took the view that Jews had a religious duty to inhabit all sites of historical or religious Jewish significance in Palestine, and a right to be protected there by the IDF. Many of these sites were in or near Arab population centres. No significant faction, in any of these groupings, advocated the confiscation of land or property belonging to individual Arabs. Nor was any such policy ever implemented, though it is alleged that Israeli adjudicators often made unjust decisions when determining the ownership of unoccupied land, and that some Arab absentee landowners were prevented by bureaucratic means from claming compensation for land seized for security purposes. Within months of the end of the Six Day War, Israel was again under attack. Within months of the end of the Six Day War, Nasser embarked on the War of Attrition – a series of attacks by land, sea and air, predominantly on Israeli military targets. These were designed to be sufficiently frequent and deadly to force Israel to remain in a constant state of war-readiness, but on any particular occasion to be insufficient to provoke all-out war. Some of the aircraft participating in the war were flown by Soviet pilots who were among the 20,000 Soviet ‘advisors’ (in reality, soldiers and military technicians) who were stationed in Egypt. Israel responded by shooting back, by building a line of massive fortifications along the Suez Canal, and also by retaliating harshly against both military targets and civilian infrastructure. Nevertheless the War of Attrition, which lasted from 1967 to 1970, cost Israel 1,524 dead and about 2,700 wounded. Egypt sustained much higher casualties and enormous damage, and Israel showed no sign of withdrawing unconditionally. In 1970, Egypt and Israel agreed to a ceasefire proposed by the US, one of whose terms was that nether country would build new military installations within 50 kilometres of the Canal. Egypt immediately began doing so, installing state-of-the-art surface-to-air missile sites, supplied by the Soviet Union and manned by Soviet ‘advisors’. A series of ‘peace initiatives’ by the UN and the US followed, all of which eventually dissipated because Egypt, supported by the Soviet Union, insisted on a promise of unconditional withdrawal as a precondition for negotiating. Nasser died suddenly, but his successor, Anwar Sadat, at first continued his policies unchanged. Following the Six Day War, pan-Arab nationalism was in decline. Palestinian nationalism burgeoned. People who would previously have described themselves simply as ‘Arabs’, or ‘Palestinian Arabs’, became ‘Palestinians’, and most of them regarded the PLO as their national movement. A diplomatic and media campaign was launched in the West to legitimise the Palestinian nation, with the slogan ‘a democratic and secular state in Palestine’. Arafat became leader of the PLO. He said in 1970: “Our basic aim is to liberate the land from the Mediterranean Sea to the Jordan River. We are not concerned with what took place in June 1967 or in eliminating the consequences of the June war. The Palestinian revolution's basic concern is the uprooting of the Zionist entity from our land”. In addition to murdering several hundred Israelis between 1967 and 1973, the PLO globalised its terrorist campaign. PLO terrorists attacked Jewish and Israeli targets in Europe. They hijacked Western airliners and held passengers hostage. They tried to take over Jordan, and the Syrian army entered Jordan intending to assist them. After King Hussein secretly appealed to Israel for help, Israeli aircraft flew low over the Syrian tanks and the Syrians turned back without a shot being fired. As a result the PLO were violently expelled from Jordan by the Jordanian army and fled to Lebanon. the PLO attacked the Olympic Games in Munich in 1972, holding eleven Israeli athletes hostage and then murdering them. Some of the terrorists were captured, but were released a few weeks later, allegedly in a secret deal between the PLO and the German government (under which Germany would be spared further terrorist attacks). Mossad tracked down the terrorists, and during the following years, killed all but two of them. One of those two was Abu Daoud, who in 1999 won the Palestine Prize for Culture for his autobiography, Memoirs of a Palestinian Terrorist. In 1972, Sadat ordered all Soviet ‘advisors’ out of the country. Thus, in a move that was almost unparalleled during the Cold War, Egypt left the Soviet fold. Only four years earlier, Czechoslovakia's attempt to do something much more modest had been harshly suppressed by the Red Army. But on this occasion, the Soviets chose to comply. Syria now became, and remained until the end of the Cold War, the Soviet Union's principal client state in the Middle East. Sadat's immediate motive was to give himself more room for manoeuvre – and in particular, the option of making war in his own time and in his own way, without having to clear each decision with his superpower sponsor. On October 6, 1973, in a brilliant and meticulously planned strike, the Egyptian army crossed the Suez Canal, overwhelming or bypassing the supposedly impregnable defences, and advanced into Sinai. At the same time, the Syrian army attacked the Golan Heights, recaptured them, and began advancing towards the Israeli border. Israel was caught completely by surprise. when many soldiers were home on leave. On the morning of October 6, when the Mossad at last reported that an invasion would take place that evening (it actually came at 2pm), the government had refused Elazar's recommendation to launch a pre-emptive strike like that of 1967, because the US had warned Israel to confine itself to clearly defensive operations. The government also refused Elazar's request for full mobilisation, on the grounds that this might be interpreted as provocative. Only a partial mobilisation of 50,000 reservists was authorised. Later in the day, this limit was increased to 100,000. Elazar disobeyed these orders and sent out immediate call-up notices to 150,000 reservists, but even that was too little, too late. The IDF's contingency planning had assumed that the Israeli Air Force could slow any enemy advance during the first 48 hours of an invasion. But in the event, Israeli aircraft suffered severe losses from the Soviet-built missile batteries on the Egyptian side of the Canal, and were prevented from flying low enough to affect the battle on the ground. The Syrians, too, had installed mobile missile batteries on the Golan Heights, with similar effect in that much smaller area. The Syrians and Egyptians had assembled huge armies – a total of 1,150,000 soldiers. Only a small fraction of these were yet committed: the initial Canal crossing had been accomplished by an elite force of only 8,000 (against defenders numbering fewer than 500) immediately followed by a few tens of thousands. Syria had attacked with 1,200 tanks against the defenders' 170. On both the Egyptian and the Syrian fronts, the advances were slowed by the tenacity and sacrifice of small IDF units – most of whom had never seen combat before – and by the skill of local IDF commanders. Israel appealed to King Hussein not to join the fighting – reminding him of his misjudgement six years earlier. Though at first he seemed to be heeding the warning, the IDF still had to deploy some of its overstretched forces (which by the end of the second day had reached 200,000, two thirds of its fully-mobilised strength) to defend against possible attack from Jordan. The Lebanese armed forces remained inactive, though PLO forces in Lebanon shelled Israeli towns that lay in the path of the Syrian advance. During the second day, IDF reinforcements reached the Golan Heights and began to drive the Syrians back, but at the cost of heavy losses in lives and equipment. In Sinai, complex battles raged, but the Israeli reinforcements made no headway, succeeding only in preventing the Egyptians from advancing beyond the range of their anti-aircraft missile sites. Both sides were now using ammunition and supplies at a prodigious rate, but the Soviet Union was replenishing the Arab armies in massive airlifts. Israelis were shocked when Britain refused to meet even existing contracts for ammunition. Britain had imposed another arms embargo ‘on both sides’, except that it continued to supply Jordan (which it considered a ‘non-combatant’), and to train Egyptian military pilots. About a week into the war, huge tank battles began – the second largest in history (the largest being the battle of Kursk in the Second World War). The Egyptian Army, having been reinforced and re-supplied, made a determined breakout from their positions on the eastern side of the Canal, heading for the passes through which Sinai could be crossed. The Syrians fighting on the Golan Heights were reinforced by 15,000 Iraqi troops and hundreds of tanks, as well as elite forces, with tanks, from Jordan. The IDF eventually won both these battles, destroying a significant proportion of the Egyptian and Syrian tanks, and nearly all the Iraqi ones, though again at great cost in Israeli lives. But it had now run critically short of ammunition and equipment. In particular, its British-made Chieftain tanks, a key weapon on both fronts, were about to run out of ammunition and become useless. US President Richard Nixon, after long hesitation, decided to end his own embargo and re-supply Israel. However, Britain refused to allow its airfields or airspace to be used for this purpose. Portugal was persuaded to allow US aircraft to land en route to Israel, but most of these supplies arrived too late to be used. IDF General Ariel Sharon, who had been urging an out-flanking counterattack across the Suez Canal since the second day of the war, was finally given permission to launch one on the ninth day. On its way to making the crossing, his force had the bad luck to run into two Egyptian divisions that had just been deployed there following the previous day's battle. It fought its way through and crossed on a pre-fabricated bridge. Its first priority then was to attack and destroy the missile batteries. The second was to cut off supplies to the Egyptian army on the east side of the Canal. This was eventually achieved, and with that, the war against Egypt was won. Meanwhile a last, all-out counter-attack by the Syrians, Iraqis and Jordanians was defeated at the Golan Heights. The Arab armies were no longer capable of effective resistance. The roads to Damascus in the east, and to Cairo in the west, were open to the IDF. The UN Security Council convened and ordered an immediate ceasefire. Despite the military victory, Israelis were profoundly shocked by the Yom Kippur War. 2,688 of them had been killed, thousands wounded, and it seemed to many that their world had come closer to being destroyed than at any time since the Holocaust. Israeli society and politics were permanently changed. Some concluded that the policy of retaining Sinai and the Golan as buffer zones had been vindicated, since a similar war starting at the 1948/9 ceasefire lines would have been fought out in Israel's cities, whose populations would have had nowhere to flee to. Others concluded that the war had proved that the concept of a ‘buffer zone’ was outdated and that the territories had no great military value: the enemy had crossed the border with apparent ease despite Israel's massive fixed defences, and victory had been achieved not through any defences but through counterattack. The huge scale of the war, the role that had been played by the Soviet Union and the decisive effect of advanced weapons (such as anti-aircraft missiles), made it clear to most Israelis that for the foreseeable future Israel's security would depend on a close relationship with the US. The cost of the war – the equivalent of Israel's entire gross national product for one year – forced Israel to apply to the US for loans and aid. All this was demoralising in a culture that deemed itself to be predicated on self-reliance and self-defence. The ruling Labour coalition suffered a severe loss of public confidence, which it has never fully regained. There was a mood of national pessimism. The effect on the Arab world was in some ways the mirror image of the effect on Israel: despite the catastrophic military defeat, heavy casualties and stupendous economic cost, the consensus among Arabs was that honour had been regained and that a significant strategic victory had been won. But on the other hand, Sadat, along with many Egyptians, also concluded that if even this assault had been repelled, despite its good planning, good cooperation among Arab states, surprise, modern weapons, force of numbers, enthusiastic superpower assistance, and good luck, then Israel was there to stay. Also, Israel's new relationship with the US would make it all the stronger. Six months before Sadat's historic policy change, a Likud-based coalition had taken power for the first time in Israel. So it now fell to the Likud leader, Menachem Begin, a former Irgun commander, longstanding champion of the cause of unrestricted Jewish settlement, and implacable opponent of any hint of appeasement, or trust, of Israel's enemies, to decide how to respond to Sadat's overture. On the same evening, Begin invited Sadat to Jerusalem to address the Knesset. The broad elements of the peace treaty – peace and recognition for Israel, in return for the Sinai peninsula, which Israel had captured from Egypt during the Six Day War – were agreed immediately. This was the first time that any Arab nation had agreed to the principle of the partition of Palestine. But the details became the subject of gruelling negotiations which lasted until 1979. For the Israelis, one of the most difficult of the Egyptian demands was that the Jewish settlements that had been built in Sinai be evacuated, but they eventually agreed to this. In an operation overseen by Ariel Sharon (then a member of the Cabinet), 2,800 bitterly resisting inhabitants were forcibly evicted by IDF soldiers, and their homes and orchards razed to the ground to make it impossible for them to return. Sadat and Begin shared the Nobel Peace Prize for this treaty. To this day, Egypt and Israel have adhered to it. They maintain fully accredited embassies in each other's countries, trade is officially permitted, as are tourism and all other normal exchanges between neighbours. No threats of war, implicit, explicit or indirect, are issued. Egypt does not tolerate the launching of terrorist attacks on Israel from its soil (though Israel has a longstanding complaint that Egypt does not prevent the smuggling of weapons to terrorists operating from Gaza). However, although the treaty required the parties to “seek to foster mutual understanding and tolerance and ... abstain from hostile propaganda against each other”, there was no specific provision for a cessation of anti-Semitic incitement in the Egyptian press and other government-controlled media, or in the mosques and schools. Such incitement continued to increase. Today, very few Israeli businesspeople or tourists actually visit Egypt, because of the risk to their lives. The rage of the Arab world was turned against Egypt. All Arab countries broke off or scaled back diplomatic and trading relations with it. Saudi aid was cut off. But the US made good the financial losses, and Egypt came to be regarded as a US ally in the region. Gradually, relations with the Arab world have been restored, so that by now, the only significant hostility that remains towards Egypt is from Islamic fundamentalists. However, Egypt has still not regained its former position as the generally accepted leader of the Arab world. Iraq under Saddam Hussein tried hard to take over that position. With the assistance of France and Germany, Iraq began to build a nuclear reactor at Osirak, for the purpose of manufacturing nuclear weapons. When Iran (which was fighting a bitter war with Iraq at the time in which some one million people were to die) had attacked this reactor but failed to do much damage, Saddam Hussein had said that the attack had been futile anyway, because the target was Israel alone. In June 1981, Israeli aircraft attacked and destroyed the reactor, just before it was to have become operational. This action was ferociously criticised by every other nation and by almost every shade of opinion everywhere in the world, including the US government and including the Israeli Labour Party. The US determined that Israel had violated the terms of its purchase of US aircraft by using them for such a purpose, which they said “cannot but seriously add to the already tense situation in the area”. As punishment, the US suspended deliveries of aircraft to Israel. Two European governments, in return for oil, have assisted the Iraqi tyrant in the construction of atomic weapons. We again call upon them to desist from this horrifying, inhuman deed. Under no circumstances will we allow an enemy to develop weapons of mass destruction against our people. We shall defend the citizens of Israel in time, and with all the means at our disposal. In October 1981, Sadat was murdered by Islamic fundamentalists for making peace with Israel. The Vice-President of Egypt, Hosni Mubarak, became President, which he remains to this day. Terrorism, and the PLO in particular, had been playing an ever-increasing role in the region and in the world, and had become an accepted feature of the political scene. In May 1974, PLO terrorists took control of a school at Ma'alot in northern Israel, and murdered 22 children. In October 1974 an Arab summit conference at Rabat declared the PLO the ‘sole representative’ of the Palestinian people. In November 1974 the UN endorsed that decision by granting the PLO observer status – in effect, UN membership in all but name. In many respects the PLO had (and continues to have) access to more privileges of membership of the UN than Israel. Arafat declared “The goal of our struggle is the end of Israel, and there can be no compromise or mediations. We don't want peace, we want victory. Peace for us means Israel's destruction, and nothing else.” Eleven days later, armed with a pistol, he addressed the General Assembly of the UN, and received a standing ovation. The following year, the General Assembly, with 75 countries in favour and 35 dissenting, passed a resolution declaring Zionism to be a form of racism. This was not received with uniform enthusiasm everywhere – for instance, the centre-left Observer newspaper in Britain noted that all the states defined as ‘Islamic’ in their constitutions had voted for the resolution, while Israel's constitution guaranteed equal rights to all citizens regardless of religion or race – but nor was the resolution enthusiastically opposed by any nation or significant political faction outside Israel and the US. It took until 1991 for the General Assembly, under intense US pressure, to rescind the resolution, with 25 member states still voting to retain it and 13 abstaining. At the same time, continuous US pressure to recognise anti-Semitism as a form of racism was resisted until 1993. Over the years, Arab delegates to the UN have repeatedly, and sometimes successfully, attempted to introduce anti-Semitic blood libels into the official records of the UN. Israel has often been censured both by the UN General Assembly and the UN Security Council, but neither body has ever censured the PLO or any Arab state for any attack on Israel. In 1982, Israel invaded Lebanon. The Syrian army and air force intervened with aircraft and tanks but were defeated – in the case of the air force, humiliatingly. The PLO retreated northwards, entered the city of Beirut and made a stand there. After holding out there for several months as the Israelis systematically shelled or bombed every building containing PLO fighters, an operation that cost many civilian as well as PLO lives, they agreed to leave Lebanon, and set up a new base in Tunisia. Israel withdrew from most of Lebanon, retaining a 25-mile buffer zone to protect its northern border. The Israelis had been welcomed in Lebanon by the Christian factions, who held the PLO responsible for destabilising the fragile balance that had previously existed between them and the Muslims. The Christian militias became allies of the IDF. During the Israeli advance northwards, one of those militias, the Phalangists, was assigned the task of rooting out PLO fighters in two Palestinian refugee camps in Lebanon, Sabra and Shatila. The Phalangist leader, Lebanese President Bashir Gemayel, and 25 of his followers, had just been assassinated in a bomb attack widely attributed to the PLO. The Phalangists took revenge on the civilian inhabitants of the camps, murdering hundreds. An Israeli commission of inquiry subsequently found that Ariel Sharon, then Israel's Defence Minister, had been negligent in not foreseeing such an event, and he was forced to resign from that post. The Israeli political movement Peace Now, which had been founded in 1978 and advocated unconditional withdrawal from the West Bank, Gaza and the Golan Heights (and now from the Lebanon buffer zone) followed by negotiations suing for peace, received a surge of support. On September 25, 1982, a Peace Now demonstration in Tel Aviv attracted 400,000 participants, 10% of Israel's population at that time. In 1981, Israel had annexed the Golan Heights, but although Begin mooted a plan to give the inhabitants of the West Bank and Gaza full Israeli citizenship and then to annexe those territories, no serious steps were ever taken to implement it because there was insufficient support for it from almost any side in Israel, including the Likud Party itself. Israel had become deeply split on the issue of Jewish settlements in the West Bank and Gaza Strip. The right-wing and religious parties, though they could agree on no long term policy for the territories, were nevertheless enthusiastically in favour of Jewish settlement. Thanks, again, to the electoral system, the settlement movement attracted more and more government assistance – to the extent that the traditional Zionist project of building settlements in Israel proper all but ceased. New immigrants and people on low incomes were now being attracted in large numbers to the settlements, not out of any prior connections, religious feelings, or nationalistic zeal, but because they received heavily subsidised housing and a living standard not available to them elsewhere. And every additional settler enlarged the constituency for more subsidies. The fundamentalist Islamic terrorist organisations, Hamas (founded in 1982) and Islamic Jihad (founded in 1979) began to compete with the PLO for support and power. Violence against Jews was one of the principal means of acquiring both. but during the same period, 528 Arabs were murdered by the PLO, Hamas and Islamic Jihad. The victims were ‘collaborators’ – which in practice could mean not only any Arab who warned Jews of impending attacks, but any Arab who had any sort of friendly dealings with Jews. Personal and political scores were also settled. Also during those four years, 697 Arabs were killed by Israeli soldiers, the overwhelming majority of them during riots. 78 of them were under 15 years old. Throughout the Intifada period (and to this day), terrorist murders by Hamas and Islamic Jihad, including suicide bombings, continued. Some analysts believed that support among Palestinians for these Islamic organisations might soon exceed that of the secular PLO; furthermore, a new generation of young radicals, the local leaders of the Intifada, were also challenging the ageing PLO leadership who were in exile with Arafat in Tunisia. For the first time, it appeared that the PLO and Israel might have a common interest, in counteracting those forces. The Israeli elections of 1992 brought in a Labour-led coalition under Yitzchak Rabin. In January 1993, in total secrecy, Israeli and PLO negotiators met in Oslo to begin what later came to be known as the ‘Oslo Peace Process’. This culminated in 1994 and 1995 with the Cairo Treaty and an agreement known as ‘Oslo II’. These brought an end to Israeli rule in Gaza (excluding only the Jewish settlements there), plus an area to be known as ‘Area A’, which contained all the Arab cities of the West Bank with the exception of the small Jewish enclave at the centre of Hebron. Israeli forces would withdraw completely from those areas. A new organisation, the Palestine Authority, with the triumphantly returning Arafat as its Chairman, would have “legislative, executive and judicial powers and responsibilities”, with complete control over the internal affairs of Gaza and Area A, including control over a Palestinian police force, armed by Israel. It would also exert civilian control over another area of the West Bank, ‘Area B’, which contained most of the Arab villages, but Israel would retain its military presence there. The IDF would retain control over the remainder of the territory, Area C, which contained 4% of the Arab inhabitants of the West Bank and all the Jewish settlements. The PLO, in return, renounced terrorism, agreed to prevent terrorism by other organisations, cease anti-Semitic and anti-Israeli incitement, and alter the term in its Constitution that called for the destruction of Israel. Free and fair elections would be held. Negotiations about the ‘final status’ would begin immediately, and a timetable was agreed for settling all the disputed issues, including the status of Jerusalem and of Palestinian refugees, culminating in the creation of a State of Palestine alongside Israel. In the Oslo agreements the PLO accepted the principle of partition – a ‘two-state solution’ – which the Arabs had rejected in 1947 and which previously only Egypt had accepted. Arafat won the Nobel Peace Prize for this, along with Rabin and Shimon Peres, Israel's foreign minister and architect of the Oslo agreements. However, within a few days of the Cairo treaty, Arafat had made a speech in a mosque saying that the Palestinians would ‘continue their jihad until they had liberated Jerusalem’. This was dismissed by many as mere rhetoric, but from then on, Arafat and other PLO leaders began making systematically different statements when they were speaking in Arabic from when they were addressing Western audiences. In the latter case, they maintained the line that they had taken the historic decision to renounce violence and accept the partition of Palestine; in the former, they said that the Oslo peace process was merely a stepping stone to their original objective of a unitary Arab state in the whole of Palestine. The PLO's renunciation of the relevant item in its Constitution was equivocal. The PLO's emblem remained a map of the whole of pre-1947 Palestine. The emblem of Fatah (Arafat's faction which is the principal constituent of the PLO) remained a similar map covered by crossed rifles and a grenade. Palestinian schools in Gaza and Areas A and B taught the doctrine of a unitary Arab state following the destruction of Israel. Anti-Semitic incitement and blood libels became part of the culture to an extent not previously known in history with the possible exception of Nazi Germany. In 1999 Arafat's wife Suha, in a speech in the presence of US First Lady Hillary Clinton, accused Israel of using poison gas on Arab children, and of causing “cancer and other horrible diseases”. In Hamas-run schools and nurseries, children were taught that their purpose in life was to kill Jews and to become ‘martyrs’ (i.e. suicide murderers). The PLO swept aside the structures of civil society, such as the civil service and free press, and established totalitarian control with all positions of even the slightest influence filled by PLO loyalists and controlled ultimately by Arafat alone. Opponents were systematically intimidated or murdered. Only Hamas and Islamic Jihad survived to oppose the PLO, and even they had many members imprisoned. Israel and Jordan signed a peace treaty with similar provisions to the treaty with Egypt. The treaty has been scrupulously adhered to, and in practice, Israel's relations with Jordan are somewhat warmer than the ‘cold peace’ that prevails with Egypt. Several other Arab countries have established trading, but not full diplomatic, links with Israel. Other Arab countries, notably Saudi Arabia, Iraq and Libya, remain implacably opposed to Israel and maintain the old boycotts and support for terrorism. Following the fall of the Soviet Union in about 1989, Russia and former Communist Bloc states had re-established full diplomatic and other relations with Israel (and the Czech Republic resumed a fairly warm friendship). Now, another batch of states such as India, China and the Vatican, which had previously been hostile to Israel, followed suit. One of the provisions of the Israel-Jordan treaty was that Jordan abolished its law that had in effect made selling land to Jews punishable by death. Ironically, the incoming Palestine Authority revived that law. Property owners who had sold their land to Jewish settlements, and real-estate agents who had brokered such deals, were executed. The new Mufti of Jerusalem (now a PLO appointee) ruled that such criminals must be denied a Muslim burial. In 1995, Rabin was murdered by a religious Jew opposed to the Oslo peace process. He was succeeded as Israeli Prime Minister by Peres, who lost the subsequent election and a Likud-led coalition took power. An election in the Palestinian-controlled areas confirmed Arafat in power with 90% of the vote and no serious opposition. Terrorist violence and murders of Israelis by Hamas and Islamic Jihad, including occasional spectacular mass murders, increased. In 1999, Ehud Barak was elected Prime Minister (under a slightly altered electoral system that elected the Prime Minister directly and hence gave him a powerful mandate) at the head of a new Labour-led coalition. Barak embarked aggressively upon a quest for peace. He ordered a unilateral withdrawal from the buffer zone in Lebanon. The Lebanese terrorist group Hizbollah, which had previously specialised in suicide bombings against Israeli forces in the buffer zone, now concentrated on terrorism across the Israeli border. Israeli and Syrian ministers met under US auspices to ‘talk about talks’. Syria demanded a promise of unconditional withdrawal from the Golan Heights as a precondition for negotiations. No progress was made. plus East Jerusalem including the Jewish holy sites, would form a new State of Palestine. In reply, the Palestinian negotiators demanded that every person of Palestinian descent be allowed the ‘right of return’ to Israel. The negotiations broke up. The PLO initiated a ‘second Intifada’, this time based on terrorism and suicide bombings. The Barak government continued to press for peace. Under a previously negotiated agreement, the IDF transferred control of Jacob's Tomb (an ancient Jewish shrine) to the Palestinian police force. Immediately, the tomb was desecrated and then destroyed stone by stone by an Arab mob which included the Palestinian policemen guarding it. Two Israeli reservists who lost their way near Ramallah were captured by the PLO. An Arab mob entered the building where they were being held and tore them apart. Their murderers appeared on the balcony waving their bloodied hands to the cheers of the crowd and then threw the bodies to the crowd for further desecration. A Palestinian policeman murdered his Israeli counterpart on one of the joint patrols that had been agreed. Gunmen entered a joint security meeting and murdered the Israeli policemen taking part. Widespread violence continued. With elections imminent in which Barak faced defeat, last-ditch peace talks were held at Egyptian town of Taba. Arafat gave a vitriolic speech accusing Israel of being “fascist”. The talks broke up and terrorist murders of Israelis increased further, with Arafat now taking a leading role. All Hamas and Islamic Jihad prisoners in PLO custody were released. On February 6, 2001, Ariel Sharon became Prime Minister of Israel. He appointed Natan Sharansky as one of his Deputy Prime Ministers. He declared that Israel would make ‘painful concessions’ in return for peace, but only in return for peace. On September 11, terrorists attacked the World Trade Center in New York and the Pentagon in Washington, D.C., murdering thousands of Americans. Palestinians took to the streets to celebrate.